The Truman High School Varsity Cheerleading Team will hold its "Cubs Cheer Camp" beginning on August 18 and running for for 3 days. Cost is $25 and the camp starts at 6 p.m. and runs until 8 p.m. each day. Preregister on Wednesday, August 12 at the high school track at Truman from 6-8 p.m. Cheer camp designed for grades 1-8. Divisions made based on age groups.Each group will learn a halftime routine and stunts based on their specific age groups. Prep for school tryouts will be taught and tips will be given and discussed. Cougar Cub cheerleaders will be taught by Varsity Truman cheerleaders also assisted by JV cheerleaders. Truman cheer coaches will oversee the entire event. Cheer camp T-shirts will be handed out on the day of performance Cougar Cub cheerleaders will be invited to perform their routine (date TBA). For more information email michellerenacope@gmail.com or visit the Truman field Tuesdays and Thursdays from 6-8 p.m. While registration is $25. it is discounted to a total of $40 for two siblings, instead of $50. Also camp shirts are going to be given on the day of performance (halftime). Halftime performance will be on JV first home game as of now is Wednesday, September 2. The 2015 Junior League World Series begins on Saturday, August 15, with the opening ceremonies at World Series Field at Heritage Park. All the teams will be introduced, several speeches will be made and there will be a fireworks display. Opening Ceremonies including Fireworks, 8 p.m.
USA East vs. USA West, 11 a.m.
Asia-Pacific vs. Latin America, 2 p.m.
USA Southeast vs. USA Southwest, 5 p.m.
Puerto Rico vs. Canada, 8 p.m.
USA Southeast vs. USA Central, 11 a.m.
Canada vs. Europe/Africa, 2 p.m.
Latin America vs. Puerto Rico, 5 p.m.
USA West vs. USA Southwest, 8 p.m.
Asia-Pacific vs. Puerto Rico, 11 a.m.
USA West vs. USA Southeast, 2 p.m.
Latin America vs. Europe/Africa, 5 p.m.
USA East vs. USA Central, 8 p.m.
Latin America vs. Canada, 11 a.m.
USA East vs. USA Southwest, 2 p.m.
USA West vs. USA Central, 5 p.m.
Asia-Pacific vs. Europe/Africa, 8 p.m.
USA Southwest vs. USA Central, 11 a.m.
Asia-Pacific vs. Canada, 2 p.m.
Puerto Rico vs. Europe/Africa, 5 p.m.
USA East vs. USA Southeast, 8 p.m.
Open day. Events will be determined. At this point, crossover games are scheduled for 2, 5 and 8 p.m. between the third-, fourth- and fifth-place teams in the USA and International pools. Note: World Series teams are determined during national and regional tournaments. Specific leagues, cities, states and countries will be known prior to opening ceremonies. The first annual Pars for Pups Golf Tournament is scheduled for August 15 at the Taylor Meadows Golf Course. It will benefit Pound Pals of Taylor and the campaign to create the City's first dog park. The tourney is $65 per player in a four-person scramble format. Included in the ticket will be golf, lunch at the turn, dinner at the end of the day and plenty of prizes. Shotgun start at 8:30 a.m.
To sponsor or participate for the Pound Pals, call (313) 702-2929. To sponsor or participate for the dog park, call (734) 341-3591. The 2015 Downriver Scleroderma Support Group Walk is scheduled for August 15 at Heritage Park. All funds go to support, education and research for the Scleroderma Foundation. Walk at 9 a.m., register at 8 a.m. Contact Annie (313) 291-2055 for more information. The Taylor Conservatory Foundation and the Wayne County Community College Downriver District's Prechter Educational and Performing Arts Center has announced its 2015 Music and Arts in the Gardens concert slate. This is the popular Wednesday summer concert program at the Taylor Conservatory & Botanical Gardens. Each Wednesday from June 10, through August 26, the event celebrates music and art. Tickets are $5, seating is limited and those attending should bring lawn chairs. Doors open at 5:30 p.m. with the concert from 6:30-8:30. Food and drink is offered by Silvershores Waterfront Banquet & Catering. For more information, click on www.taylorconservatory.com or www.facebook.com/taylorconservatory. For general information for weather alerts during the concert season, call (888) 383-4108. 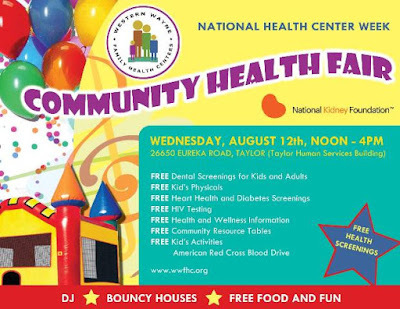 The annual Community Health Fair, part of National Health Care Week, is being held from noon-4 p.m. Wednesday, August 12, at the Taylor Human Services Building, 26650 Eureka Road. 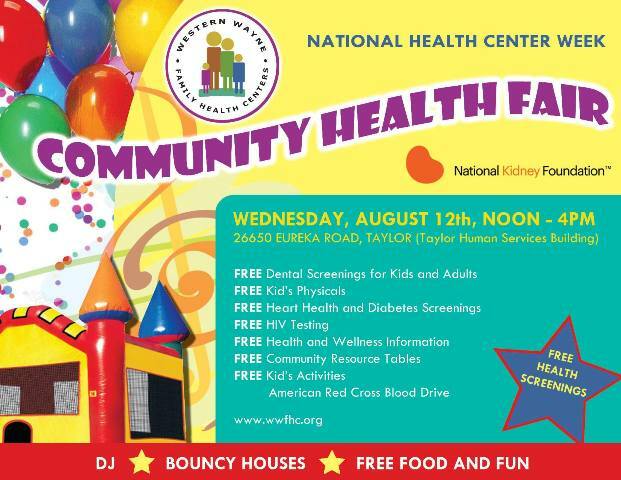 DJ, bouncy houses, free food and much more. Click on www.wwfhc.org for more information. Park It Family Fun Nights has scheduled another FREE outdoor movie night in Heritage Park, starting at 6 p.m. Tuesday, August 11. The event will begin at 6 with live music by the George Brothers at 6:30 and the movie -- "Night at the Museum" -- beginning at 8:20. Included will be activities for children, giveaways and much more. For more information, click on www.parkit4fun.com.